Chanteclaire Farm has certainly seen more than its fair share of beautiful brides in gorgeous gowns, but our grooms are equally as fashionable and cut quite a dashing figure. While you may think men's fashion doesn't provide the variety of options that wedding gowns afford, you would be surprised at how creative and sophisticated our grooms manage to be for their big day. It's true that when everyones heads turn to watch the bride glide down the aisle, the bride has eyes only for her man. Our grooms give their brides something great to see. We find ourselves drawn to the men that focus on the details to make sure they stand out. Here are a few of our favorite groom fashions over the past few seasons. Photocredit: The Happy Couple The fun colors and coordinating patterns of the tie and pocket square make this groom's look really pop. Photocredit: Grace Photography Bowties and suspenders hit the mark for this groom's party. Photocredit: Kirsten Smith The paisley tie and unique boutonniere really pop against this gray suit. Photocredit: Amberlee Christey After this couple's butterfly release, the groom had an addition to his boutonniere look. Photocredit: Sonlight Imaging Who says the groom has to wear a three piece suit? Wearing a vest is trendy, and perfect for hot summer weddings. Photocredit: Karlo Photography Gorgeous gray with a pop of color make for a striking combo. Photocredit: Karlo Photography A tartan tie with matching pocket square is ultra chic...extra points for matching the bride's bouquet wrap. Photocredit: Vicki Grafton Your initials and wedding date in your suit jacket is a hidden, but adorable, detail. Photocredit: Amberlee Christey This gorgeous gold pocket watch is the perfect accent for the groom who knows the importance of making it to the ceremony on time. Photocredit: Karlo Photography A message from the bride sewn into the groom's tie is a lovely idea. 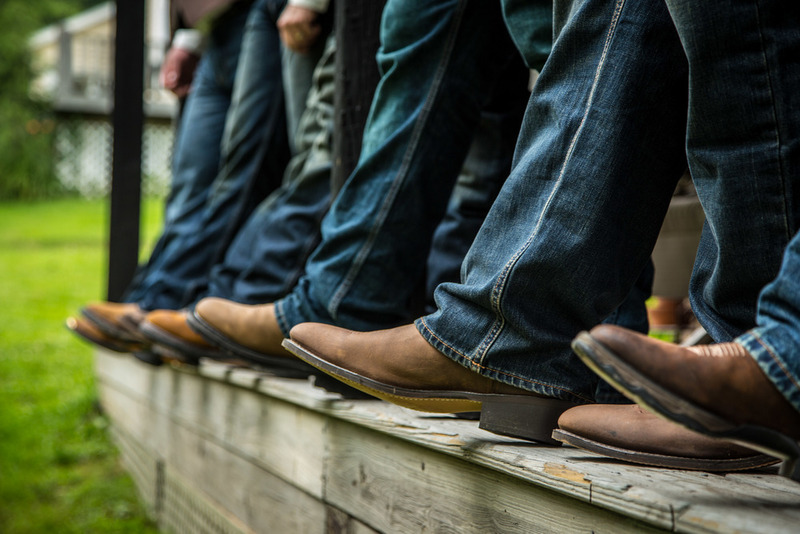 Photocredit: Higher Focus We were in love with this group's matching jeans and boots. Photocredit: Higher Focus A belt buckle fit for a groom. Photocredit: Karlo Photography This daring groom rocked quite the dashing hat. And who says denim has to be styled casually? This denim tux is gorgeous. Photocredit: Vicki Grafton The argyle socks and perfect fit of this suit make this groom's look an instant classic. Photocredit: Kelsey Kradel A three piece suit is a classic that will never be out of style. Try fun colors, like navy, to give it a fresh spin. Photocredit: Amanda Briscoe We love a well tailored suit. Photocredit: Karlo Photography There's no better opportunity to have your own custom suit created than your big day. We especially love the fun lining this groom chose. Photocredit: Derek & Diane What could be better than a man in uniform? Photocredit: Cassidy Duhon Classic black and white with a skinny tie always looks chic. Here at Chanteclaire Farm we admit to being a bit shoe obsessed. There's nothing quite as satisfying as finding a gorgeous pair, and spending the next few days daydreaming about the perfect outfit to wear with them. If shoes are that important on a regular day, you can imagine how captivating it can be for brides to find the perfect pair for the biggest day of their life. Being a farm that specializes in outdoor ceremonies, there are a few practical considerations to keep in mind. We love a good pair of stilettos, but they don't pair particularly well with soft grass. Don't let this make you think for a second that the sky isn't the limit in choosing the most amazing pair for your big day at Chanteclaire Farm. Here are just a few examples of swoon-worthy shoes our beautiful brides have rocked in recent seasons. A hint of bling peeking out from your gown is fun and gorgeous. Flats are far from boring when they're made of delicate lace. We're in love with the sparkly rhinestone accent on these ballet flats. These booties hit the mark on so many levels- ruffle trim, gorgeous lace, and a delicate bow accent on the back. Two brides are better than one...and two pairs of matching teal flats are made even more adorable with the gold accents. We were swooning for these green peep toe classics. These bright red heeled oxfords manage to be fun and comfy at the same time. We love the saturated color of these royal blue beauties, and polka dots are always a yes. Now it's your turn, Chanteclaire ladies. Show us your favorite pics of your wedding shoes to inspire this season's brides.